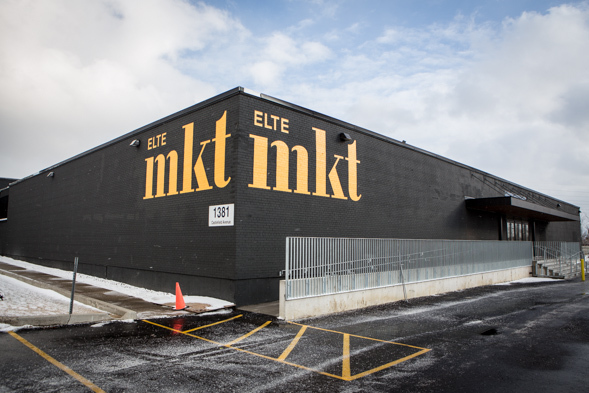 Elte Market is the brand-new offshoot of Elte , located just a few blocks away from the original in the Castlefield Design District . 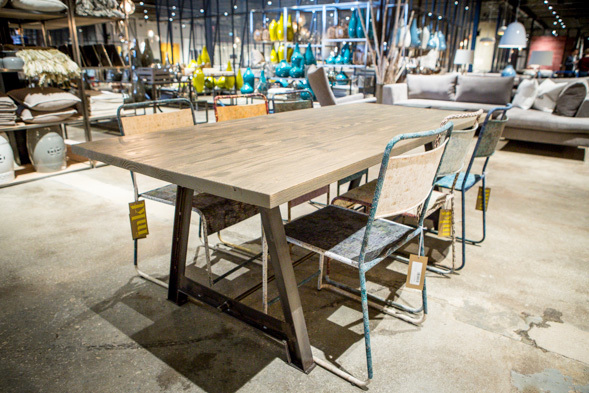 Like its predecessor, the mammoth home goods store is a family affair - it's the brainchild of brothers Jamie and Andrew Metrick, whose family has operated Elte for the past four generations. As the duo became more involved in the family business, spending four months out of the year on buying trips, they began discovering vibrant, unusual items that they loved, but couldn't quite see as a fit for the more stately, upscale Elte. They finally took the plunge, opening up in what was once a Canada Goose factory last November. "It's really catering, in general, to a bit of a younger demographic," says Jamie, as we tour the 40,000 sq. ft. shop. "It's sort of for the urban homeowner," Andrew offers. "Maybe it's their first time going through the process of furnishing their home - or the first time they're really caring about something, they're not just grabbing a sofa from a friend or something out of a basement. If you're going through the process, we want to try to make it as easy as possible." Part of that is eliminating long backorder times for furniture by ensuring every product they have on the floor is in stock. Their strategy is to buy tons of items in small amounts - as Jamie puts it, "we buy a lot of breadth and little depth" - which also ensures that the product offerings are always changing from visit to visit. 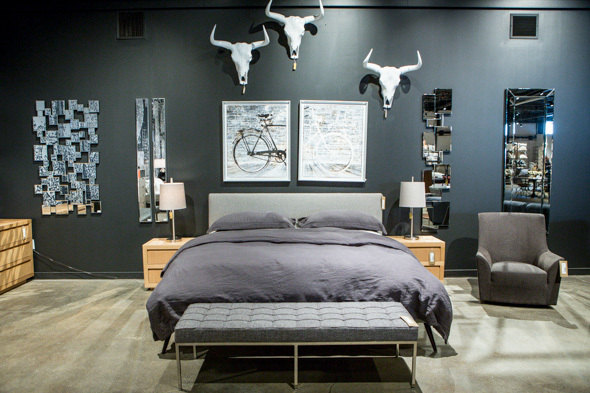 Since urban living inevitably means small spaces, you'll find a few clever space-saving tricks here: In the beds section, there's an elegant tufted model ($1395) that flips up to reveal storage space under the mattress, while sofas are scaled down (without just making them all loveseat-sized). 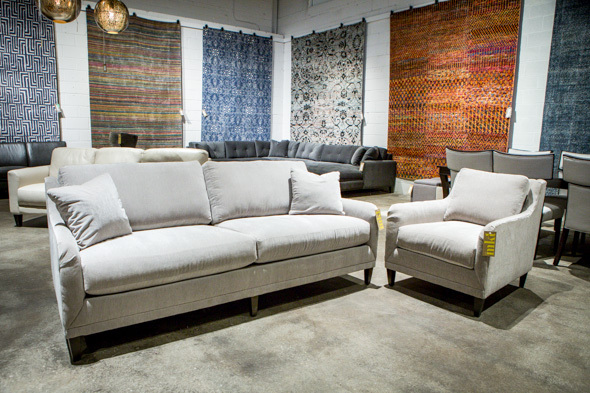 "We've opted for trying to make the most economical designs out of a proper-size sofa - thinning the arms as opposed to shrinking the sofa down," Andrew says - that way, you still get more seating space, but it doesn't take up so much room. 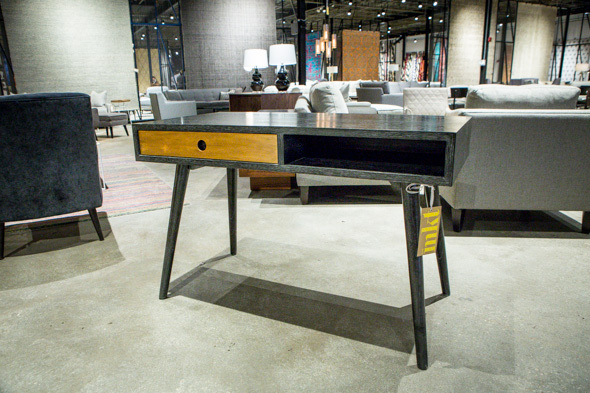 The Metricks' furniture-biz connections and buying experience lends itself to unusual pieces. On a trip to Indonesia, Andrew came across a batik factory and a metal chair factory next door to one another and got the two to work together. The result, batik-patterned chairs ($175), can now be found in stock in a variety of patterns. "We turned what was a very industrial schoolhouse chair into something that I think is extremely cool and pretty." 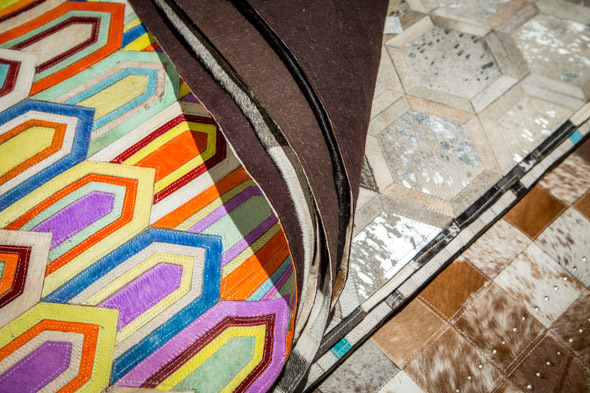 That global touch extends to their dizzying array of rugs, which takes up the back half of the store: patchwork cowhide versions, overdyed vintage kilims, or rugs woven with scraps of sari silk, hemp and bamboo silk. 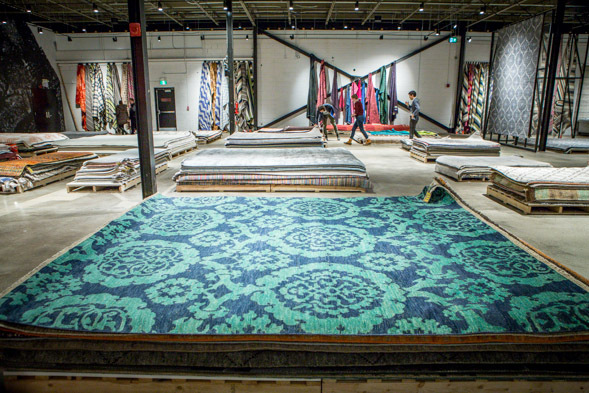 "We've got about 2,000 rugs here, on the premises, with huge variety," Jamie says. "I don't think anyone has that in the price point we have" - between $600 and $1200, depending on size. 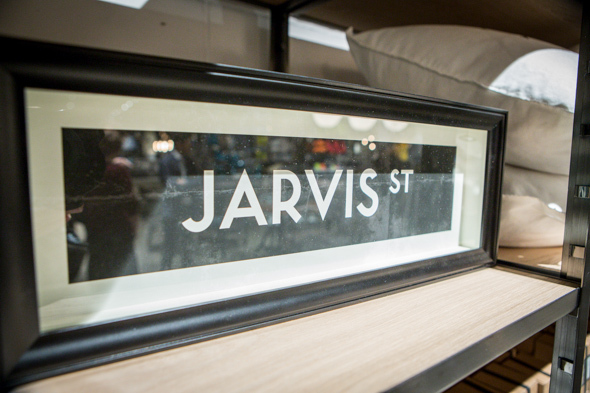 There's also organic cotton bedding, poufs, retro desks, artwork (including framed mock Toronto street signs, a nod to their local roots), and plenty of knick-knacks. The massive space even fits a large "Finds" overstock section, where you might find heavily discounted coffee tables or leather chairs, as well as an events space that's going in on the upper floor. The selection is enormous - and, if you keep an eye on the price tag, can be quite budget-friendly. Dining chairs start at $95 and sleep sofas start at $595, while queen-sized bed frames start at around $995. 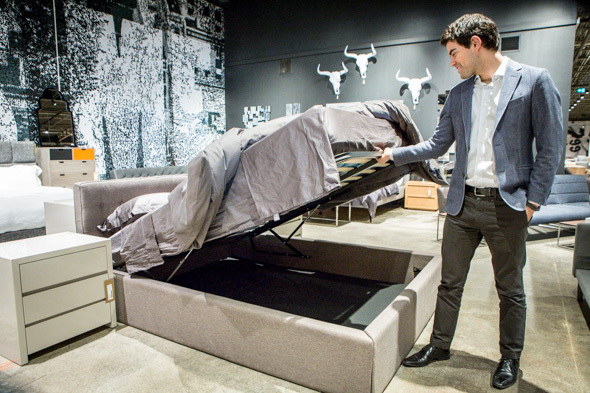 "We do feel there's a hole in the market for this type of furniture," Jamie says. "There's the CB2s or the West Elms of the world - they have great big stores, but they're big-box and they move slowly. Then there's the Queen West stores or store in the Junction, but they're small, so you can only buy so much there. What we're really trying to do is be that hybrid in between."